On Friday, July 23, 1976, a large assemblage of government officials, dignitaries, foreign ambassadors and a thousand visitors came together at Niagara Falls, New York and the Niagara Falls State Park. At 11:00 am, the morning skies were gray and the weather was forecasting scattered showers. 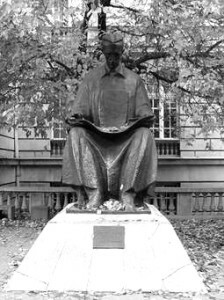 The 9-foot-high bronze sculpture with a custom-designed granite base was created in Yugoslavia by Croatian sculptor Frano Krsinic. As it was unveiled, the skies opened, casting shining sunlight upon the larger than life Tesla figure. In the near distance was the preexisting monumental stone portal that was original to the Adams Power Plant. Planners of the event were Robert M. Cleary Jr., Vice President and general manager of The Niagara Mohawk Power Corporation and Nicholas A. Beldecos, vice president of the Large Rotating Appliances Division of the Westinghouse Electric Corporation. The dedication speeches were orated by Frank G. Zarb, head administrator of the United States Federal Energy Administration under the presidency of Gerald Ford. Mr. Zarb accepted the sculpture from Dr. Ivo Margan, president of the Socialist Union of Croatia and Dimce Belovski, the Yugoslavian ambassador to the United States, who performed the actual unveiling of the sculpture. Mr. Zarb read a message from President Gerald Ford, “This is a splendid Bi-Centennial gift of a statue and was a fitting tribute of a man of vision” The Masters of Ceremony were Orin Lehman, commissioner of New York State Parks and its chairman, George M. Martin. The dedication proceeded with a large tent luncheon and the afternoon included a festival of dancing and singing with Yugoslavian folk artists. 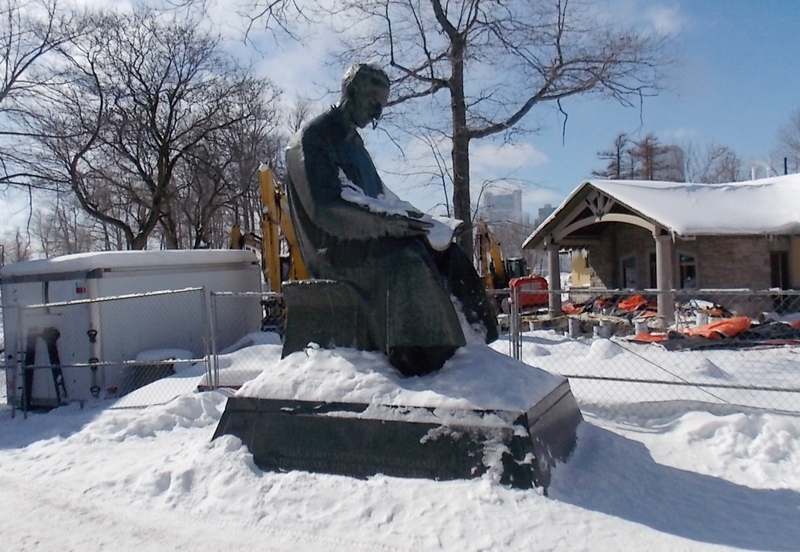 Currently, Frano Krsinik’s famous ” Nikola Tesla ” sculpture is waiting to be removed from his protective granite pedestal and moved into a storage. This $25,000 dollar professional restoration project will take place during 2015-16. The sculpture will then be located somewhere else on Goat Island. It is the hope of our organization that the final destination of this work of art will be at the “Tesla Science & History Museum”, located in the Adams Transformer building on Buffalo Avenue in the city of Niagara Falls, New York. FRANO KRSINIC is a renowned Eastern Europe artist and is considered one the three most important Croatian sculptors of the twentieth century. He was born in 1897 in Lumbarda on the island of Korcula. His family had a long tradition of laborer’s and stone craftsmanship. As a young man, he was trained in the art of stone crafting in the local school, but then proceeded to attend a sculpting school at Hooice in the Czech Republic. Frano graduated there in 1916 and enrolled at the Art Academy in Prague. He studied in the classes of J.V. Myslbek and J. Stursa, graduating in 1920. In that same year he returned to Croatia and began his career as a freelance sculptor. From 1924 he lived permanently in Zagreb, teaching and lecturing at the Academy of Fine Arts. By the late twenties his ideas of individual expression were formed, moving away from the mainstreams of art deco. He was influenced by artist Mestrovic. 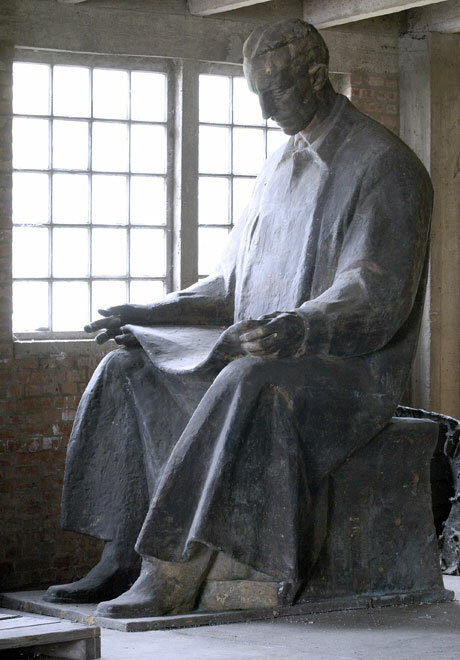 In 1947 he was conferred the title of “master sculptor” and nominated as head of the postgraduate sculptural workshop at the Academy of Fine Arts. In 1948 he became a member of the Croatian Academy of Arts and Sciences. His teaching career lasted until 1967. 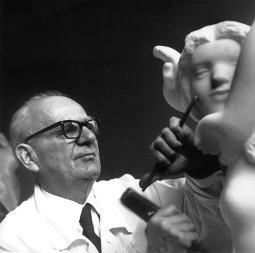 Over this long period he trained and coached a number of successful young sculptors from Croatia and abroad. In 1975 he retired from active career and on January 1st, 1982 he died in Zagreb. The works of Frano Krsinic are exhibited in private collections and museums in London, Geneva, Moscow, Berlin, Munich, Stockholm, New York, Washington, Addis Ababa, Kawasaki and elsewhere. COPY: 01/23/2013 (The Balkan Transitional Justice) …COPY: ” The war damaged the Krsinic sculpture. This was the third casting, in 1981. It could not be restored at the Zagreb Visual Arts Academy’s foundry in 2006, so a mold was made from the existing Belgrade sculpture and a clone- sculpture was cast in bronze. 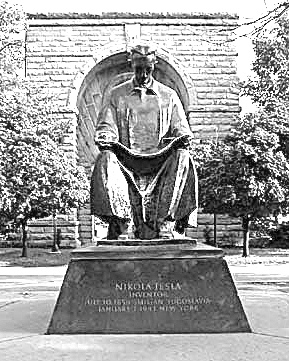 When the 150th anniversary of Tesla’s birthday was celebrated and with collaboration between the Croatian and Serbian culture ministries, the monument was stated as “completely finished” Nikola Cerjanc, the deputy director of the foundry, told recently described the artwork as a “masterpiece” in a media statement. However, the government is still arguing over its installation site “.